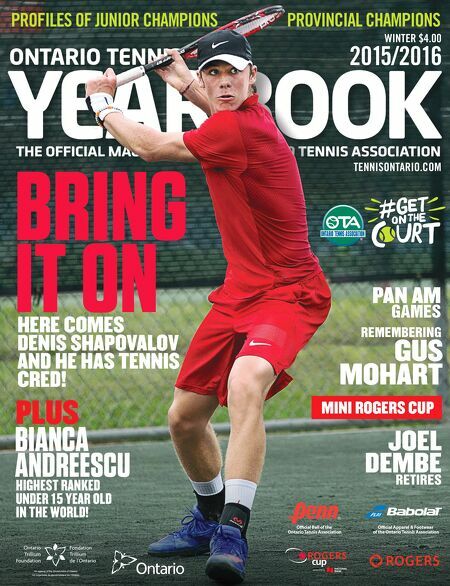 1 YEARBOOK 15/16 www.TENNISONTARIO.com PROFILES OF JUNIOR CHAMPIONS PROVINCIAL CHAMPIONS REMEMBERING 2015/2016 WINTER $4.00 TENNISONTARIO.COM PLUS Ocial Ball of the Ontario Tennis Association Ocial Apparel & Footwear of the Ontario Tennis Association HERE COMES DENIS SHAPOVALOV AND HE HAS TENNIS CRED! BRING IT ON BIANCA ANDREESCU JOEL DEMBE RETIRES PAN AM GAMES GUS MOHART MINI ROGERS CUP HIGHEST RANKED UNDER 15 YEAR OLD IN THE WORLD! An agency of the Government of Ontario. Un organisme du gouvernement de l'Ontario.